We all know the dead factories, the dying factory towns. 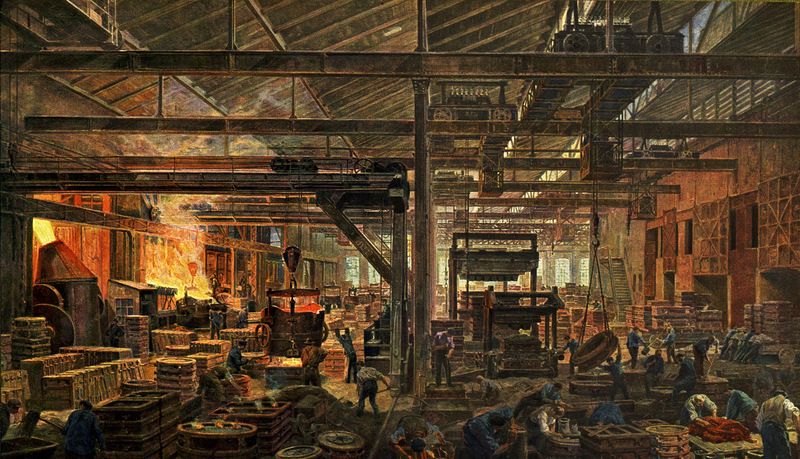 But what was it really like back when the industrial revolution was just reaching its peak? What was it like 100 years ago? Bottom: Essen today. Like the US, Germany struggles to find uses for its miles of abandoned industrial structures. Back in 2006, I premiered my Bethlehem Steel movie Almost Gone at an art gallery in New Jersey. After the premiere I spoke briefly with a retired steel-industry engineer. He took my card. Two days later he called me and told me he had something I would like to see, so I arranged to meet him. He had a large brown envelope with only a date on it: 1912. Apparently, the engineer's grandfather was a steelworker at Krupps Stahlwerke in Essen, Germany and the envelope was his retirement gift. 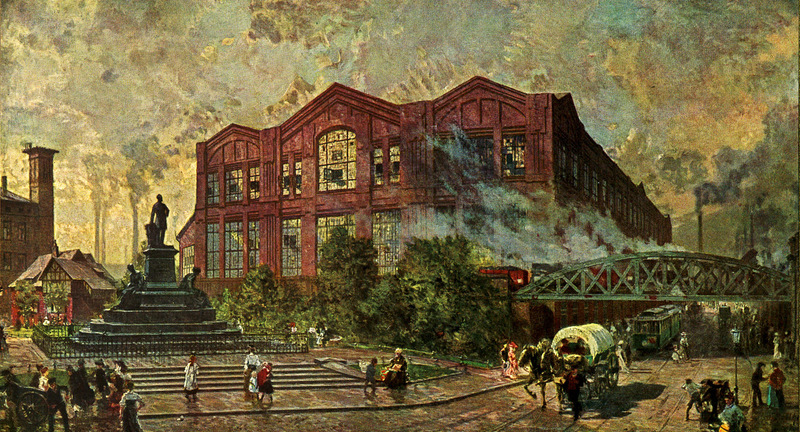 It contained 15 full-color prints derived from paintings of life in and around the Krupp steel mills back in the early 1900s. 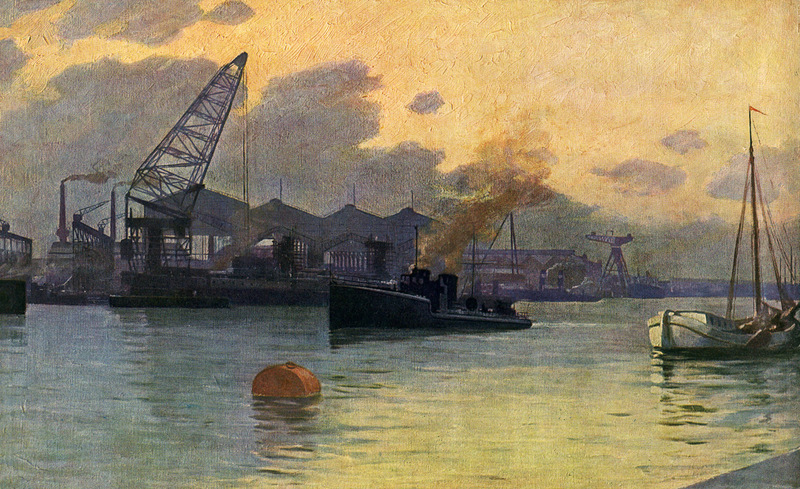 An examination of the prints revealed the signature of Otto Bollhagen (1861-1924) - who I later learned was a noted German industrial artist. The engineer explained that the envelope had just sat in his attic for decades - and he wanted me to have it. He said I would probably be a better guardian of it than anyone else he knew. I accepted with the intention of scanning the prints for the world to see, but the prints were too large for my flatbed scanner and an exploratory trip to Kinkos put a $300 price tag on getting them scanned. So they sat in my attic until I found an affordable way to scan them... until now. 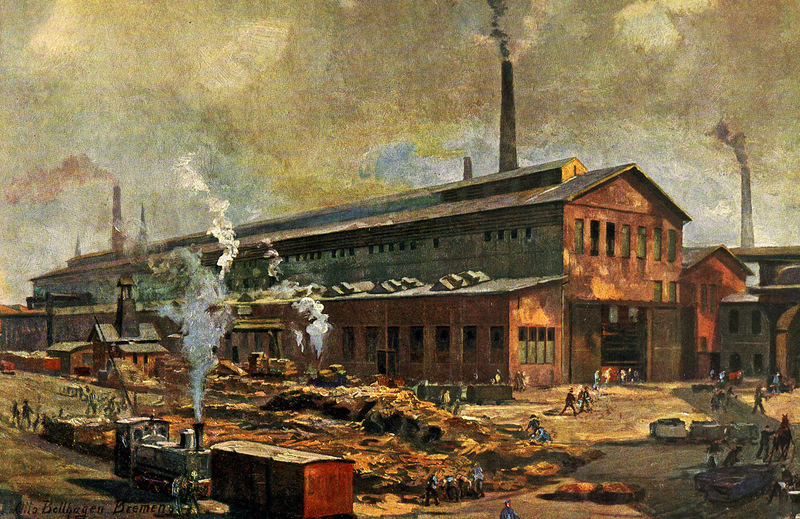 The once-mighty Krupp steelworks in Essen dates back to Anton Krupp's gunsmithing shop ca. 1624. 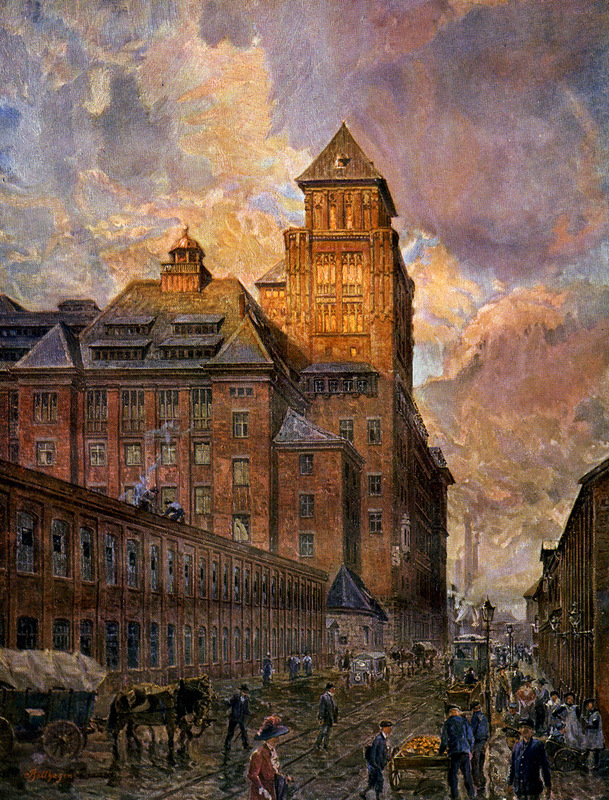 The Krupp metalworks spanned six generations and became the world's largest industrial company and the largest private company in the German empire. They were heavily involved in weapons manufacturing, and became the main arms supplier to Nazi Germany during WWII. 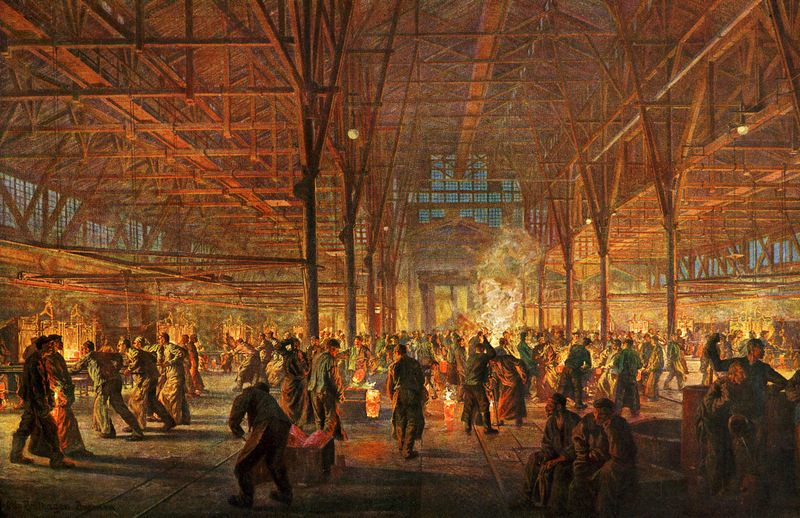 During the war, Hitler allowed Krupp to take over steel operations in occupied nations, and use an estimated 100,000 slave laborers from the concentration camps. 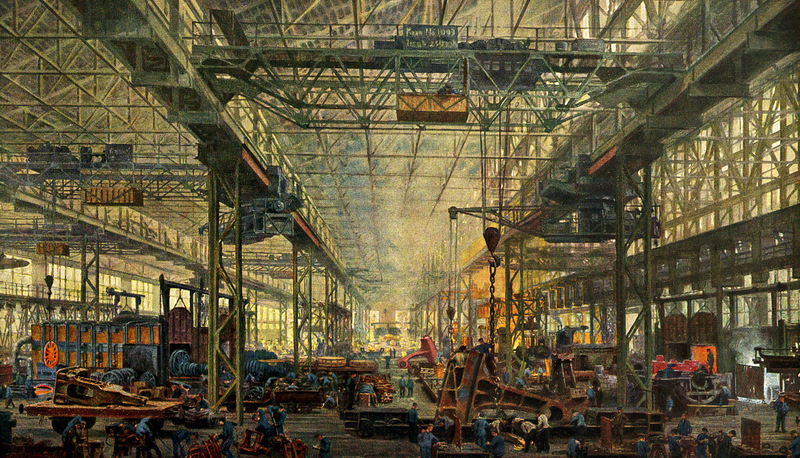 The Krupp works in Essen, however, was heavily bombarded by Allied forces. 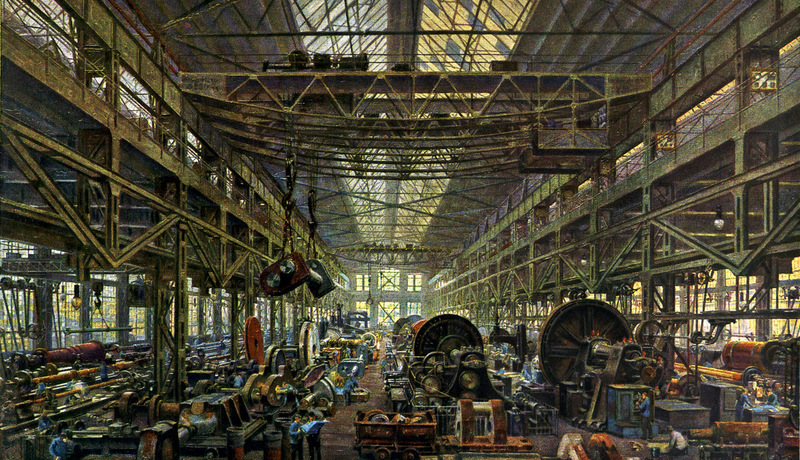 By the end of WWII, the Krupp works in Essen fell under the British Zone of occupation. 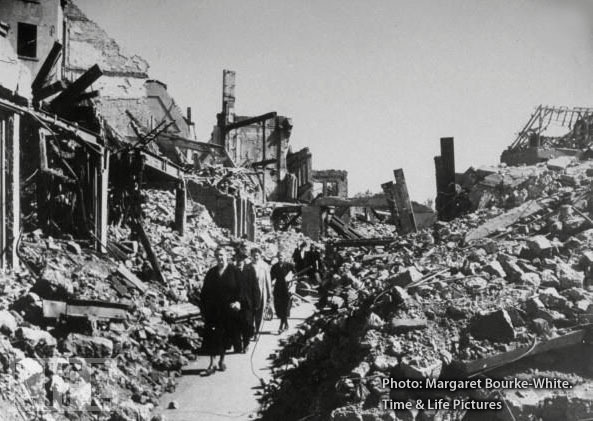 The Brits dismantled what remained and sold it as war reparations. Alfried Krupp was condemned to 12 years in prison for crimes against humanity. 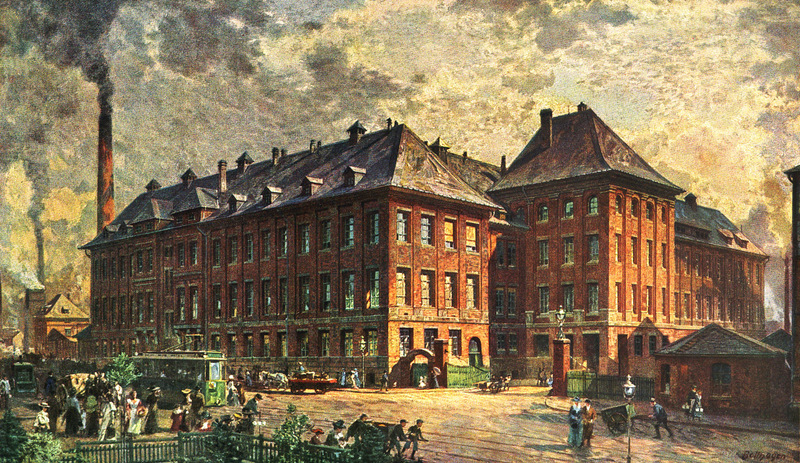 After the war, Krupp rebuilt. 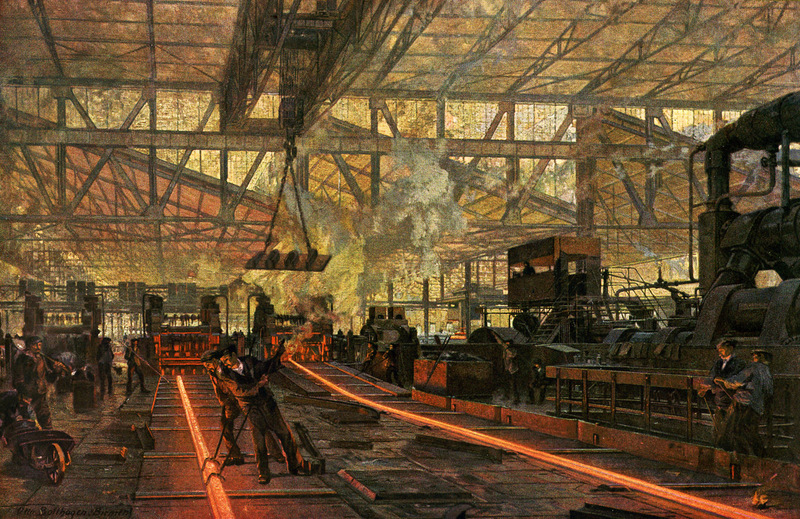 But by the 1970s, the Krupp corporation began to experience the effects of globalization. 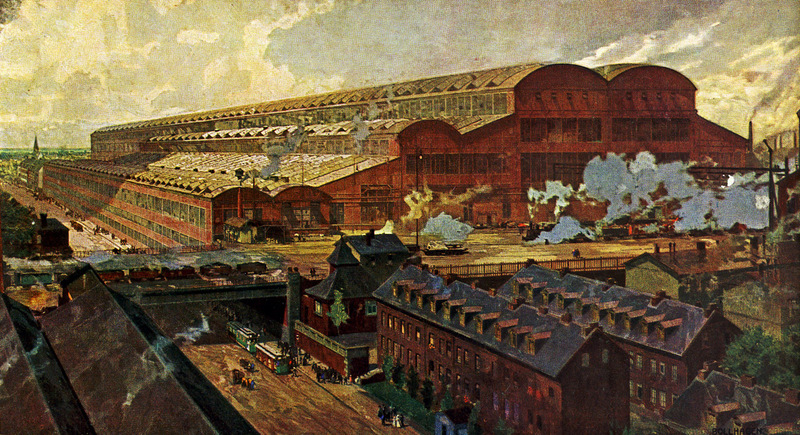 Much like its European and American counterparts, Krupp began losing market share to developing Asian steel markets. 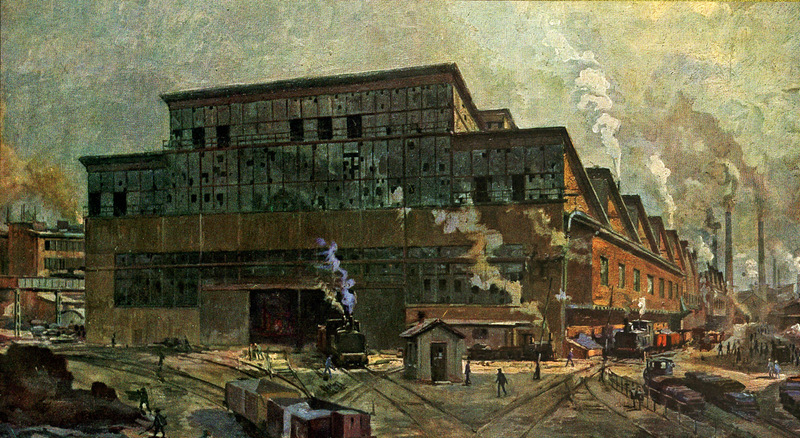 Krupp merged with its largest German competitor Thyssen and continues to exist today as ThyssenKrupp. And while ThyssenKrupp continues to make steel, most of the plants in Essen are now closed. So now I present to you the amazing artwork of Krupp Stahlwerke ca. 1912 - enjoy! 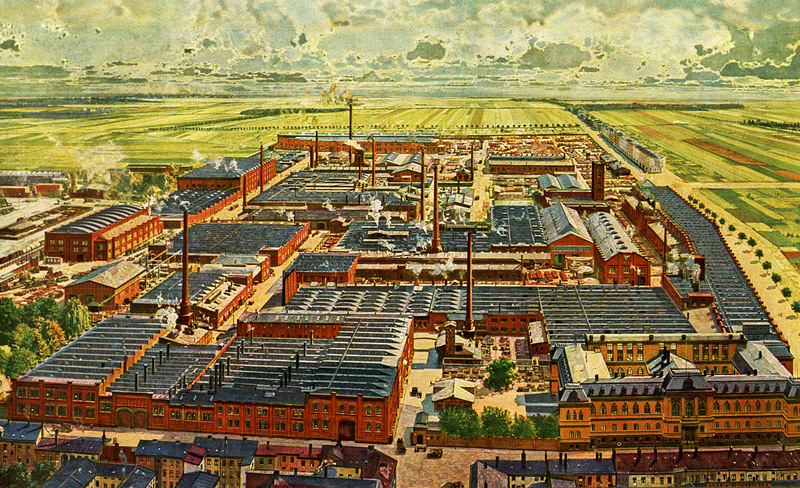 The set of prints began with this tri-fold aerial view of Krupps' main plant in Essen. Note the prominently positioned Alfred Krupp statue. Click here for a photo of the statue following Allied bombing in WWII. The main office building still lives on as the Hotel Movenpick. 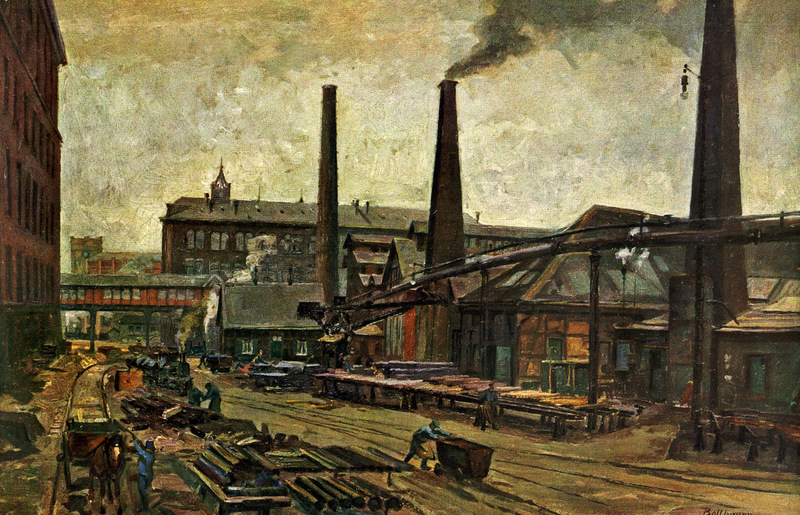 This was the oldest part of the steel works in Essen and dates back to Anton Krupp's original gunsmithing shop.